This easel provides a large work area with 2 sides – a chalkboard and magnetic whiteboard. Both sides feature a clip to hold paper. Includes 4 detachable storage bins for holding art accessories, 77 magnetic letters and numbers and an eraser. Otheraccessories shown are not included. Colours and styles may vary. Dimensions: 57Lx69Wx108.5Hcm…. 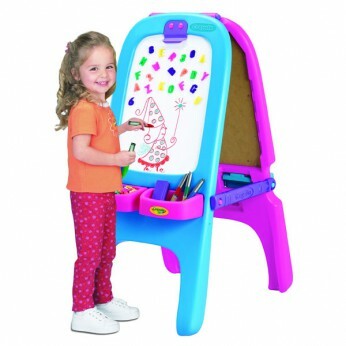 This toy costs approximately £42.99 (for the latest and best prices make sure you check our retailer list for the Crayola Pink Magnetic Double Easel above). In our review of Crayola Pink Magnetic Double Easel we classed it as being suitable for ages 1 to 3 years but recommend you check the manufacturer specific advice before purchasing.